Synthetic peptide derived from residues 1 - 100 of Mouse PSD93. PSD93 is part of the PSD-95/SAP90 family containing a modular structure with three PDZ-, one SH3- and a guanylate kinase-like domain. PSD93 is expressed in discrete neuronal populations as well as in specific non-neuronal cells. PSD93, like PSD-95, binds to NMDA receptors and to the neuronal nitric oxide synthase (NOS). PSD93 and PSD95 can heteromultimerize with each other and are recruited into the same NMDA receptor and K+ channel clusters. PSD93, however, is unique among PSD95/SAP90 family members in its expression in Purkinje neuron cell bodies and dendrites. Our Abpromise guarantee covers the use of ab12097 in the following tested applications. WB Use a concentration of 0.3 - 3 µg/ml. Detects a band of approximately 110 kDa (predicted molecular weight: 110 kDa). Required for perception of chronic pain through NMDA receptor signaling. Regulates surface expression of NMDA receptors in dorsal horn neurons of the spinal cord. Interacts with the cytoplasmic tail of NMDA receptor subunits as well as inward rectifying potassium channels. Involved in regulation of synaptic stability at cholinergic synapses. Part of the postsynaptic protein scaffold of excitatory synapses. An N-terminally truncated L27 domain is predicted in isoform 2 at positions 1 through 27. Palmitoylation of isoform 1 is not required for targeting to postsynaptic density. Cell membrane. Cell junction, synapse, postsynaptic cell membrane, postsynaptic density. Cell junction, synapse. Membrane. Cell projection, axon. Concentrated in soma and postsynaptic density of a subset of neurons. Western blot using mouse brain extract (10µg protein/lane) to test specificity of PSD93 (ab12097); PSD93 immunising peptide (ab12392) was used as a control. ICC/IF image of ab12097 stained SKNSH cells. The cells were 4% formaldehyde fixed (10 min) and then incubated in 1%BSA / 10% normal donkey serum / 0.3M glycine in 0.1% PBS-Tween for 1h to permeabilise the cells and block non-specific protein-protein interactions. The cells were then incubated with the antibody ab12097 at 10µg/ml overnight at +4°C. The secondary antibody (pseudo-colored green) was Alexa Fluor® 488 donkey anti- goat (ab150133) IgG (H+L) preadsorbed, used at a 1/1000 dilution for 1h. Alexa Fluor® 594 WGA was used to label plasma membranes (pseudo-colored red) at a 1/200 dilution for 1h at room temperature. DAPI was used to stain the cell nuclei (pseudo-colored blue) at a concentration of 1.43µM for 1hour at room temperature. ab12097 PSD staining (10µg/ml) on mouse brain (5µm sagittal section on slide; 4% PFA perfused & paraffin embedded). Staining observed as expected in the hippocampus, frontal cortex and cortex with ab12097. Blue=haemotoxylin nuclear counter-stain. ab12097 PSD staining (10µg/ml) on mouse brain (5µm sagittal section on slide; 4% PFA perfused & paraffin embedded). 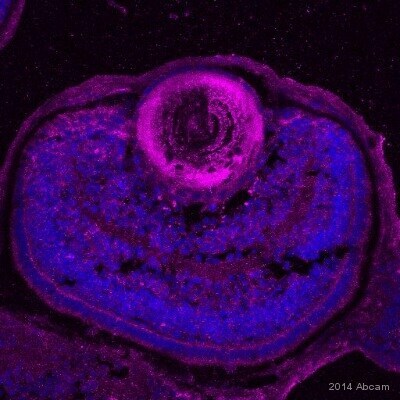 Granular staining observed as expected in [A] cerebellum and [B] hippocampus with ab12097. Blue=haemotoxylin nuclear counter-stain. Images taken with X10 objective. ab12097 has not yet been referenced specifically in any publications. Publishing research using ab12097? Please let us know so that we can cite the reference in this datasheet.